during qualifying for the Monster Energy NASCAR Cup Series STP 500 at Martinsville Speedway on March 23, 2019 in Martinsville, Virginia. Joey Logano claimed his fifth pole at Martinsville (Va.) Speedway on Saturday with a 19.356-second/97.830 mph lap in the third of three rounds of Monster Energy NASCAR Cup Series qualifying for Sunday’s STP 500. With his latest pole, he becomes the sixth different pole sitter in the six races, so far, of the 2019 season. Ford swept the front two rows of the race starting grid, with Aric Almirola qualifying second to join Logano on the front row and Brad Keselowski and Kevin Harvick taking second-row starting spots. Denny Hamlin was the fastest Toyota driver in the final round, qualifying fifth after posting the fastest laps in each of the first two rounds. His 19.355-second/97.835 mph lap in the opening round was the fastest lap, overall, of the qualifying session. 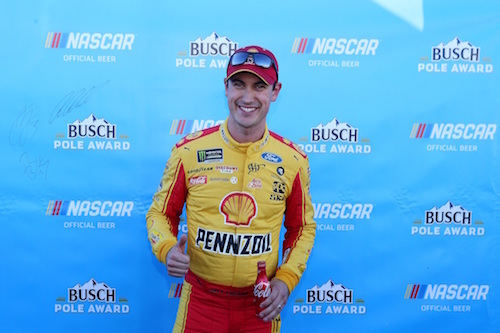 Logano looked to be in tire-conservation mode throughout the first two rounds before making four timed laps in his quest for the pole in the final lap, knocking Almirola from the provisional top starting spot with about 34 seconds remaining. He was one of only three drivers in the opening round to make only two laps in the round and the only drive to post only one official lap in the second round. The results were sixth in each of the first two rounds. William Byron was the fastest Chevrolet driver in the final round of qualifying, taking the sixth position on the grid to share the third row with Hamlin. 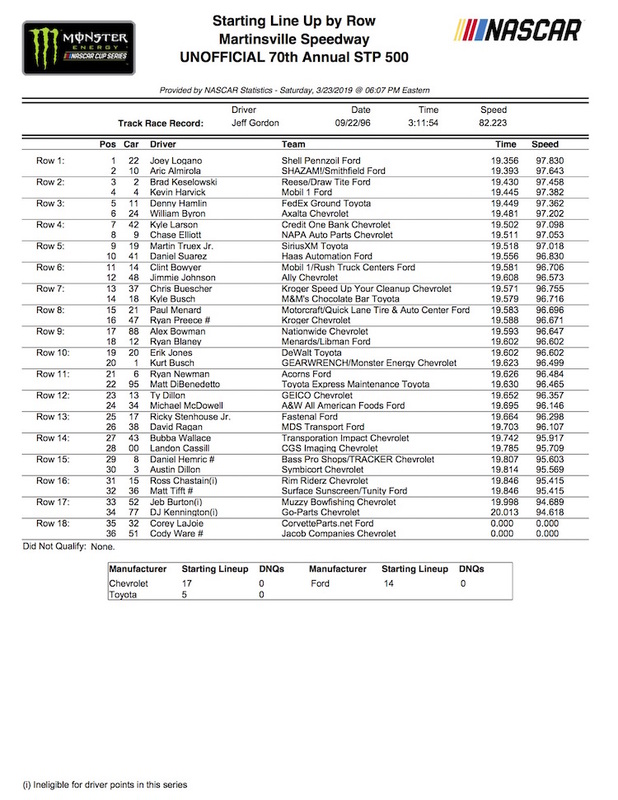 Only 36 drivers entered the STP 500, so all entrants received spots on the starting grid, even though Corey LaJoie and Cody Ware failed to post a qualifying lap time.